Writers On The Move: Does Your Business Card Include the Basics? Terry, I think of business cards as mini ads. From an artistic point of view, I love the simplicity idea coming from much of the business world. But an author needs more of a mini ad. Yep, basics but also cover and a blub or endorsement. And if an author writes in several genres, she may need several author's business cards! Like me, you've seen a lot of business cards over the years. Thank you for this post and feedback. I agree they are mini-ads. Hi Terry, thanks for your terrific post. I will be sure to follow your advice as I update my business card, especially now that I'm just starting out with the pending publication of my first book. Your information is very helpful and always on target. Thank you for the feedback. I've learned a lot from looking at other people's cards and my own trial and error. It's a process. 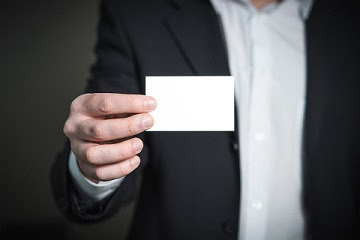 The important thing is to be creating business cards and use them effectively (something everyone can do). Terry, this is important information. It really is a mini-ad and this is a timely reminder to me that I have to update my business card. Time to visit VistaPrint. Thanks for sharing! Thank you for this feedback. I have never used Vista Print but have used many other places. My go-to resource right now is my friend in Phoenix, Ken Rutt at Epic Print Solutions: http://www.epicprintsolutions.com Hope that helps you. Thanks for the tip, Terry. I'll check Epic out. A business card has always been a valuable tool to me. Thanks for the comment.